The parents of a baby boy have sued a hospital which inadvertently swapped their new-born son with a baby girl born to a woman with syphilis. Wang Jianhua and her husband, Ye Chunhai, say they have been worried about Wang's health and that of their son since he was born at the Zhabei District Central Hospital in Shanghai on November 20 last year. Their lawsuit against the hospital, seeking compensation of 80,000 yuan (US$9,638), began hearing in the Zhabei District People's Court Wednesday. Ye said Wang gave birth to their son at 4:45am, 15 minutes before the baby girl, whose mother suffered from syphilis, a sexual and hereditary disease, was also born. 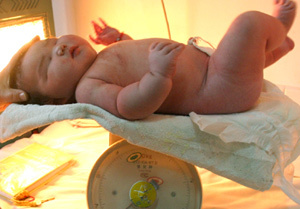 Wang and her baby were escorted to the ward about 6:50am. On the way to the ward, Wang twice asked the nurse whether the baby was her son and got an affirmative reply, Ye said. He said the mistake was not discovered until about 4pm when he changed the baby's nappy. "I saw it was a girl, not a boy," he said. A nurse found their son half an hour later. He had been sent to the hospital's intensive care unit and given a penicillin injection, because the serum test of the baby girl suggested she might have syphilis. The couple not only worried the penicillin might cause side effects to their baby but were also afraid he could have contracted syphilis from contact with the infected mother of the baby girl. Ye said they were also afraid his wife may have contracted syphilis because she suckled the baby girl. "So we had to stop breast-feeding the baby and fed him with milk powder. This made the baby weak in immunity and he has become ill often since he was born." Wang and the boy would have medical examinations once a quarter for a year, Ye said. The couple sought compensation covering the baby's milk powder, nutrients to improve his immunity, Wang's salary during the observation time and their apartment rental because they had to move out of the home of Wang's sister. The hospital admitted its nurse made a mistake but argued no negative result was caused because the hospital had adopted remedial measures, such as disinfecting the mother and the baby and testing their blood immediately. "So far, no symptom has indicated Wang and her son have got syphilis," said Xu Yong, the lawyer representing the hospital. "According to medical experts the hospital invited for Wang, the possibility of her getting the disease is very slight. "The weak immunity of the baby depends on his own constitution but has nothing to do with the penicillin injection." Both sides expressed the desire to reach a negotiated agreement. The final result wasn't available Wednesday.